IMPORTANT: for more information about cheap international flights direct to Granada airport, see this page. 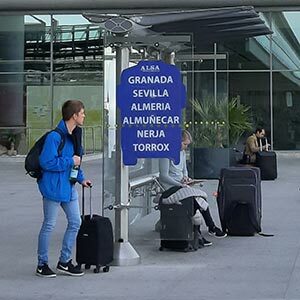 If you want to fly to Granada airport, you need to catch an international flight to Barcelona or Madrid and then a domestic flight to Granada. There are many more flights to Málaga so many people fly to Málaga and then catch a bus or hire a car (see information below). Another way to get to Granada by air is to come via one of the airports used by VUELING or IBERIA. Easyjet flies to Granada from Manchester. See EASYJET for more information. Easyjet also flies to Granada from London Gatwick (EASYJET). British Airways operates direct flights from London City Airport (UK) to Granada several times a week. The flights are fairly reasonably priced. To book tickets and for more information, see BRITISH AIRWAYS. Granada airport is 12km from the city centre. 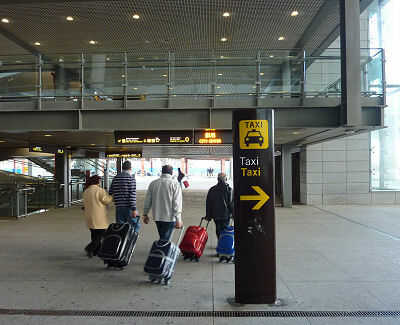 On arrival it is best to get a taxi from the airport so that you can get to your accommodation without walking through the streets with your luggage. The taxi costs about 30 euros. Click here for more info. You can book a taxi here for 30 euros. You can search for flights using multi airline searchers such as Cheapoair or SKYSCANNER. Málaga is the closest international airport to Granada and there are many flights. Málaga airport is 125km from Granada and it takes about 90 minutes to drive from Malaga to Granada. It is best to use public transport to get to Granada. The bus is faster than the train. Buses leave from Málaga bus station and arrive at Granada bus station. The journey takes between 90 minutes (11.56€) and 120 minutes (13.86€). The price of a return ticket is double the price of a one-way ticket so there is no saving in buying a return. There are direct buses from Málaga airport to Granada bus station. The journey takes 2 hours 15/30 minutes and a one-way ticket costs 11.57€/13.86€. If you arrive at another time, it is faster to catch a bus from Málaga airport to Málaga bus station and then catch a bus to Granada. There are buses to Málaga bus station every 30 minutes and the journey takes 30 minutes. It is neccessary to buy your ticket before boarding the bus from the ticket office directly outside the arrivals hall. The price of a single ticket is 3€. There are buses to Granada every hour between 7:00 and 21:30. A taxi from Málaga to Granada costs around 140 euros. Granada bus station is just outside town, so you will have to get a taxi or a bus into the centre. To buy tickets online, visit ALSA. You can check times and prices, buy tickets and book seats. If you miss the last bus to Granada, you will have to get a hotel in Málaga or club together with 4 people and get a taxi (a taxi from Málaga is about 120 - 160 euros). 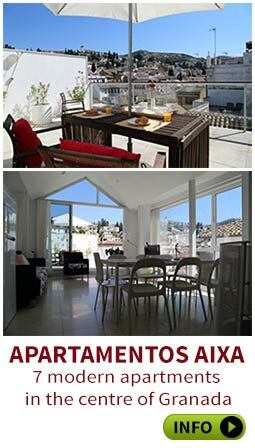 If you need a cheap place to stay in Málaga for the night, I have been told that the Cenacheros pension is OK. Otherwise ask a taxi driver to take you to a Pension or Hotel. Remember that the only point in having a car in the centre of Granada is for going on excursions. Once you are in the centre of Granada you can walk everywhere or get a taxi. Parking your car in a public carpark will normally cost at least 25 euros per day but a new carpark has opened which costs 40 euros per week (click here). Most companies have pick-up and drop-off points both at Granada airport and in the centre of Granada. There is a list of hire car companies here. Just go to the taxi rank at the airport and try to get the best price. You should be able to get the price down to 140 or even lower. You will need to show them the address of where you are going and then ask the price. It is a good idea to get them to write the figure down on a paper so that they can't later say it was higher and that you didn't understand. Latest News: It is probably best to avoid using the train to Granada until after the engineering works are finished which will happen at some time in 2019. Use the bus instead. The train station is fairly central and is in Avenida de Andaluces off Avenida de la constitución. The phone number is 958 271 272. Granada is not on a high speed line. Click here for more information. RENFE have a good website giving full information about trains in Spain, English, French, etc. Follow these links for homepage and timetables. By the way: If you want some help with train vocabulary in Spanish, visit this page. There are many buses each day to and from other large Spanish cities. To buy tickets online, visit ALSA. You can check times and prices and even choose your seats. The bus station is slightly out of town and you will need to get a taxi or a bus to get to the centre (click here for more information). If you are coming from Madrid you will need to go to "Estación del Sur". See above in "Getting from Málaga". It seems that it is not possible to book taxis in advance. However, if you phone for a taxi within Granada it rarely takes longer than 10 minutes for them to arrive. To get a taxi within Granada, just go to a taxi rank or phone 958 280 654. There are lots of taxi ranks in Granada: in front of the bus station, in front of the train station, in front of the plaza de Triunfo, in Plaza Nueva, in Fuente de las Batallas, and in front of the Corte Inglés, etc. (click here) for more info. The Spanish road network has improved a lot in the last 20 years and there are good roads to all other Spanish cities. It takes about 5 hours to Madrid, 11 hours to Barcelona, 90 minutes to Málaga. To see distances and driving instructions from other cities, click here. There are some notes for car drivers, distances etc., on this page. There is a list of hire car companies here.